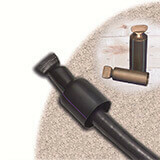 ​Providing watertight sealing of cable ends and pipe conduit. Heat shrink cable end caps are manufactured in a unique system design which results in easier handling and installation, while taking advantage of medium-wall CFM tube properties used in CCAP-RL type or heavy-wall, flame-retardant FCFW used in CCAP-FR/RL type. Unlike molded caps which are prone to splitting and puncturing, CCAP-RL offers consistent, reliable installation with its superior sealing and tear-resistant properties. Offered as a cold shrink option, the CSEC cable end caps provide a reliable moisture-proof method of sealing exposed cable ends without the use of additional tools, tapes or mastic. These heat shrink end caps are a simple yet effective method for sealing cable ends, pipe, conduit or other similar objects. These heat shrink end caps provide a simple yet effective method for sealing cable ends, pipe, conduit or other similar objects where maximum flame retardancy is required. CSEC series cold shrink end caps are designed to provide a reliable, moisture-proof method of sealing exposed cable ends without the use of additional tools, tapes or mastics. 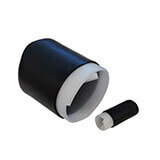 Made of EPDM rubber, the end caps are pre-expanded over a rip core and are easy to install.